The white tiger is the path, black stripes across a white body, symbolizing wholeness like the yin/yang symbol from Taoism. 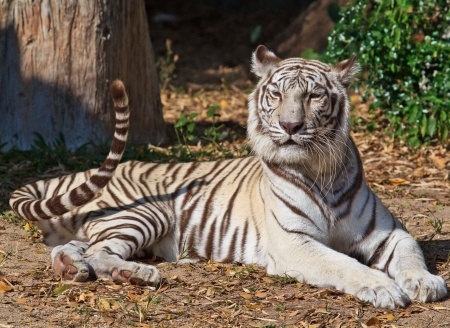 The white tiger’s fierceness, born in the deep jungle, sharpened by the will to survive, radiates from its body. As if formed from a forge, the white tiger’s claws grip the black earth like steel. To be as grounded in your trading as the white tiger, you need a grip of steel which banishes fear. To be as fearless as a lord of the jungle requires that you make your inner tiger come alive. Whether bounding through the market’s ranges to catch the trend or staring down an exhausted candlestick, you need the eye of the tiger. During the trading day, allow yourself to pace when you feel like doing so. Your inner tiger needs exercise breaks. You’ll lose your focus if you stay glued to the computer screen. Keep your tiger healthy; take it for a romp. Learn from your tiger; listen to its wisdom. Smelling the trend, follow the scent trail, aggressively pouncing on trades. While your tiger runs free through the market’s ups and downs, observe your tiger’s instinctual rhythms. Trust its animal cunning.